In Japanese gardens we often find old, reclaimed, granite and stone materials. Especially granite and stone ornaments are perfectly suited to add wonderful accents to the garden. The Japanese use granite and stone for instance to create exiting pavement. They also use big granite slabs for creating bridges crossing a stream or pond. Another great decorative item we can find in the Japanese garden is the antique reclaimed mill stone. The milling Stones are most of the time used as pavement, to create paths to connect difficult to reach areas in the garden or to cross areas of gravel and pebbles. The mill stones have a wonderful patina and will be a great addition to any Japanese style garden. Yokoso Japanese Gardens offers authentic antique reclaimed mill Stones. Some hundreds of years old. During their "productional lifespan" the granite has gained wonderful patina and coloring. The mill stones are available in variable sizes ranging from 30 up to 100 cm in diameter. Also the height of the mill stones varies. There are for instance milling stones with a height of 50 cm or more. These mill stones are perfect to be placed in a pond to create a decorative stepping stone bridge. The mill stones are available in variable sizes, colors and shapes. The big 100 cm wide mill stones are special in shape and are perfectly suitable to be used as a stacked water feature. 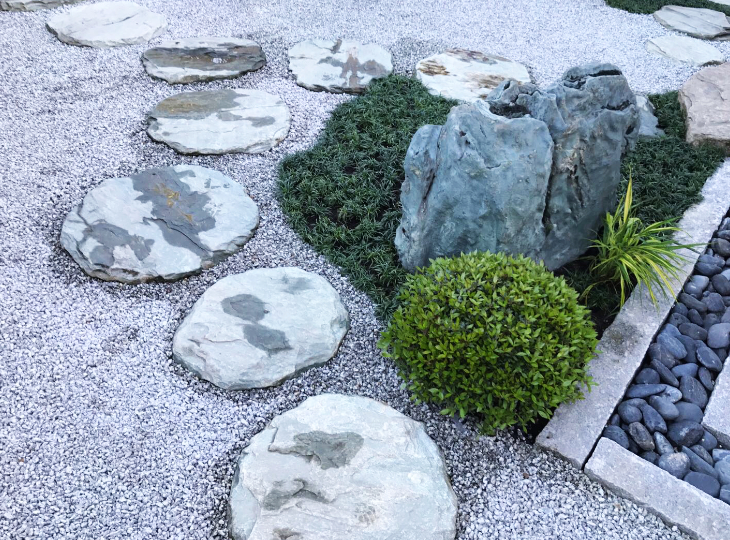 Please be advised Yokoso Japanese Gardens can also assist in the search for, purchase or lease of authentic antique Japanse mill stones, stepping stones and granite ornaments for you. Products that you won't be able to find on our website can, most likely, be ordered. Please use our contact form. Provide a clear description of the desired product and a reference to a picture on the internet and we will try to find the product for you.